At the intersection of Shoreditch and the City, Alphabeta was acquired in 2012 as a vacant corporate city office building. Over a 24 month period we turned the building 180 degrees north and upcycled it as a Hub for tech and media businesses. The development includes 6,000 sq ft of roof terraces, a 300-space basement cycle park, which is accessed through a ‘ride-in’ cycle ramp, 220,000 of new loft offices, 20,000 sq ft of high quality leisure/retail and an on-site yoga/basketball studio. 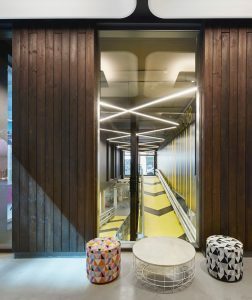 The building is let to a diverse mix of creative, tech, media and financial businesses, including WPP, Silicon Valley Bank, SEI, Open Table, Read Elsevir, Barry’s Bootcamp, Modern Pantry and We Are Social.